Batting: Rohit Sharma 97 off 61 balls, Shikhar Dhawan 74 off 45 balls. Bowling: Peter Chase 4/35 in 4 overs, Kevin O’Brien 1/36 in 3 overs. Target: 209 runs from 20 overs. Batting: JNK Shannon 60 off 35 balls. 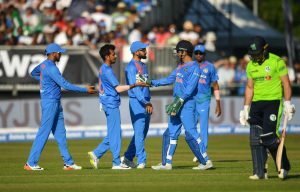 Bowling: YS Chahal 3/38 in 4 overs, Kuldeep Yadav 4/24 in 4 overs, Jasprit Bumrah 2/19 in 4 overs. The pitch appeared to be flat with some grass on the surface, in other words a proper batting surface. Irish captain Niall O’ Brian chose to field first keeping in mind the state of the pitch and short boundaries. It was also a tactic to keep India from chasing as they are really good at it. Rohit Sharma and Shikhar Dhawan walked out to bat and Rankin was given the new ball by his captain. 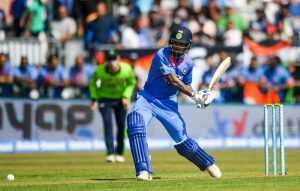 It took only 2 overs for the Indian openers to get going as boundaries began to flow off their bat and in no time they put Irish bowlers on the back foot. Scoring with a run rate of 10 per over, Indian openers reached their fifty run stand in 5 overs. This is when Ireland captain brought the left arm spinner, Dockrell into the attack along with Simi Singh who bowled from the other end. But, there was stopping these two batsmen, especially who reached his fifty in 27 balls as India crossed 100 runs. And, after another over Rohit Sharma also reached his fifty as Irish bowlers continued to go wicket less. India reached 148 runs in 15 overs and 220 – 230 runs seemed an easy target. 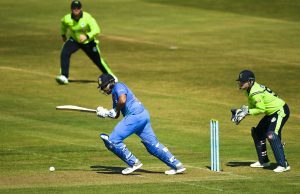 At this point, O’Brien was induced back into the attack and this move worked for Ireland as Dhawan lost his wicket as Ireland drew first blood. Raina joined Rohit Sharma who went berserk from the next over in an effort to get to his century. Raina supported him well but departed in the very next over to Chase who got his 1st wicket of the match. Dhoni joined Rohit Sharma and the experienced finisher took India over 200 runs in the 19th over. With only one over to go, India aimed to get to 220 runs, however Chase held his nerve in the last over as he denied Sharma his century and took the wickets of Kohli and Dhoni. But, it did not matter to India as they finished their innings on 208 runs. 208 runs total , which is expected by any team squad #india @imVkohli @ABdeVilliers17 & tremendous innings by #RohitSharma @RitikaSajdeh #icc & stylish, distinctive cricketer in ICC cricket history so far. Whacked on #IREvIND India 197-2, Peter Chase comes on to bowl last over, never took a wicket in his ODI career until today, got Raina earlier and takes out Dhoni, Rohit and Kohli all in the final over! The partnership between @SDhawan25 & @ImRo45 today is the highest partnership against @Irelandcricket in T20Is. 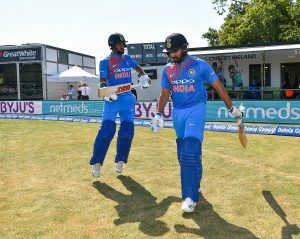 With 209 runs to win the match, Irish openers Stirling and Shannon came out to bat and Bhuneshwar Kumar and Bumrah started it off for India. Bumrah struck in his very first over as he removed Stirling to give India a good start. Balbirine joined Shannon. Both batsmen defied the Indian bowling attack for some time and added 39 runs to the total. This is when Virat Kohli brought Chahal into the attack. And, the leg spinner struck in his very 1st over to remove Balbirine as Ireland lost their 3rd wicket of the match. Simi Singh joined Shannon and the two batsmen added another 27 runs on the board and Shannon reached his fifty from 30 balls. Virat Kohli brought his other spinner, Kuldeep Yadav into the attack And, just as expected, Yadav struck in his very first over to remove Simi Singh. Wilson joined Shannon. But this stand only one over as Kuldeep Yadav struck in his next over to get rid of Shannon. Kevin O’Brien joined Wilson. Kohli persisted with Chahal and this tactic paid off as the leg spinner got the wickets of Wilson and O’Brien in two balls. With Poynter and Thompson on the crease, Ireland were now 6 wickets down and still needed to score 113 runs at a run rate of 16+ per over. 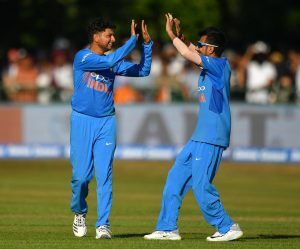 Both batsmen survived for 2 overs before Kuldeep took their wickets in his last over. Dockrell and Rankin were on the crease. Dockrell became the victim of Bumrah as Ireland slipped to 9 wickets with 2 overs left. Rankin and Chase remained at the crease till the end of the innings and India won by 76 runs. don’t underestimate but KULDEEP YADAV is more skillful and effective than Chahal, i still believe he is test cricket material, yet has performed in limited overs brilliantly. This is the end of India Vs Ireland 1st T20. Join Allsportspk on 29th June for the 2nd T20 of India Vs Ireland.